These photographs first appeared October 28, 2000. It is widely known that the Classic Blue Whale(r)s, initially salt-water creatures, do well in fresh water. However, once in fresh water, their behavior and appearance often changes. First, their lifespan tends to increase, and Blue Whale(r)s of thirty years of age or more are often encountered. However, their growth seems to be affected, as these older, fresh-water whale(r)s tend to be smaller, generally 16-feet or less in length. If taken to northern climates, their activity pattern changes, too. Often the Blue Whale(r) will become completely inactive in the winter, experiencing a hibernation-like period that stretches from mid-October to late April (in the Northern Hemisphere). But most amazing, the fresh-water adapted Blue Whale(r) appears to have evolved to be able to tolerate long periods of complete isolation from water, during which it will fall into a dormant state. Oddly, Classic Blue Whale(r)s affected like this are most often found in the rural portions of the mid-western United States, where they seems to prefer a habitat of the interior of old barns. They hide for years--sometimes decades--away from water and light, in a state of almost suspended animation with excellent preservation. 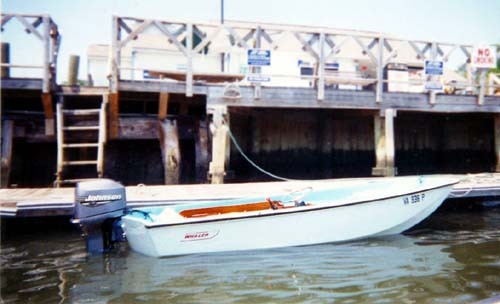 "I have recently become the proud owner of a 1968 Boston Whaler Nauset model. It has few modifications and is equipped with a 1992 Johnson 88-HP motor. "I found it in a barn in central Missouri, where it had been sleeping for a few years. The first weekend in October we took it up to Lake Superior, where we have a cabin, to give it a new home. 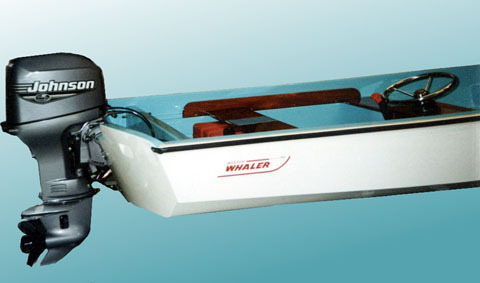 "I noticed that you did not have good photos of this vintage Whaler on your website. So attached are two photos of our boat docked on Madeline Island in Lake Superior." By hiding in a midwestern barn for many years, this 32-year old classic Blue Whale(r) was able to preserve itself in excellent condition. From its initial spawning in Massachusetts, the classic Blue Whale(r) has spread westward and northward, reaching Madeline Island in cold Lake Superior. It is believed that low water temperature reduces the effects of aging on the species. Unfortunately, when the Classic Blue Whale(r) remains in its original salt-water environment, it often experiences some deterioration of its epidermis after thirty or more years. The species, unlike some other mammals, does not seem to be able to re-generate new layers of skin on a periodic basis, and thus the appearance of the Classic Blue Whale(r) may begin to show signs of age. Frank Bell has obtained excellent results with his own technique of skin-grafting on a 13-foot Boston Whaler born in 1964. I think his method will be of interest to everyone working with older Whale(r)s. In addition to the work on the exterior skin, Frank made significant changes to the swim propulsion mechanism, but kept true to the original creature's simplicity and purposeful nature. "I have a few shots of my 13-footer that I would be honored to have displayed on your site. 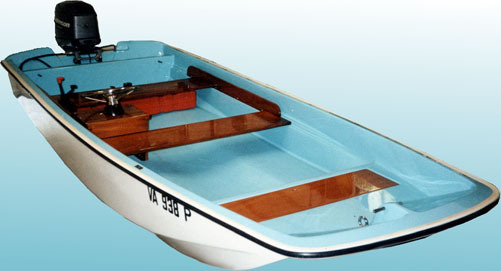 She is a 1964 model that apparently came with high bow rails and a swivel seat forward, with the remainder of the boat having the more conventional layout. I bought her in 1997 from a friend of my brother's, who had used it until the 50-HP Merc that propelled it expired. I built a "Frankenstein" Johnson 55 from parts, and that engine gave me a good season. The next year, I stripped the boat of all rails, seats, side console, etc., right down to the bare hull, in preparation for restoration of the wood interior by using the old wood as patterns for new components. "I ran her the next season with only two thwart seats and my 25-HP Johnson (1973) tiller-control. The boat was extremely fun and maneuverable. It drew almost no water, so gunkholing was the order of the day that season. "Finally this past winter, I took her to a nearby shop that I have access to and began the hull restoration and the wood finishing. First, the hull was dried in a down draft spray booth at a temperature of 120-degrees for one hour for seven straight days. Next, all existing holes (for railings, etc.) were filled. The areas where the railings had been clamped had compressed, forming dents. These had to be faired as well. "The flooring was good--except for some small chips--so I made a mold of a small section of the flooring area and used that to make my repairs invisible. Finally, after application of several coats of flexible primer that was color-keyed to the topcoat colors, the hull was resprayed with acrylic urethane that had been flexibilized. Following the respray, the entire hull was wet sanded with 1500 grit paper and polished. The wood was sprayed with a catalyzed urethane clearcoat (that was also "flexed"). And the wood was buffed to a furniture-quality finish. One last thing about the refinish process: it really quite similar to the process in which the plastic portions of an automobile are refinished, only using materials with more tolerance for the marine environment. "I installed her new motor and tank, and she is currently poking around the rivers and creeks of southeastern Virginia. The thirty-six year old hull shines like new following repainting of the gelcoat and fabrication of new wooden components for the interior. "The engine is a 2000 Johnson 3-cylinder. It incorporates most of the "Ocean Runner" series upgrades, including optical ignition, freshwater flush port for use with engine running or not, under-shroud oil tank, and so on. Originally it was a tiller model, but the engine was obviously designed for remote use. It incorporates a cylinder chamber relief to lower the compression during starting. This engine actually pulls more easily than my 1973 2-cylinder 25-HP. I chose it for simplicity and freedom of deck area (there is no battery or VRO tank), as well as the weight savings." By using a pull start engine, there is no battery to add weight to the stern and to take up valuable space. This Classic is getting back to the basics. The heavier weight of modern outboards often overwhelms the smaller Whalers, giving them a decidedly stern-down static trim. That is not evident here.